Bristol is a great city in the west of England. It was the big city to me, because I grew up in Swindon, some 40 miles away from this metropolis, and can well remember visits to its attractions. These included an ice rink and the Colston Hall, where I saw the first ever performance by a popular beat combo for which I saved good money and paid for the ticket myself. It was the Sensational Alex Harvey Band, fronted by the eponymous hard-drinking Glaswegian and featuring theatrical lead guitarist Zal Cleminson. What a band! Their music will be continue to be celebrated the length and breadth of the land when Ed Sheeran is nothing more than a wikipedia footnote in the history of Soma-music for the masses. But I digress. 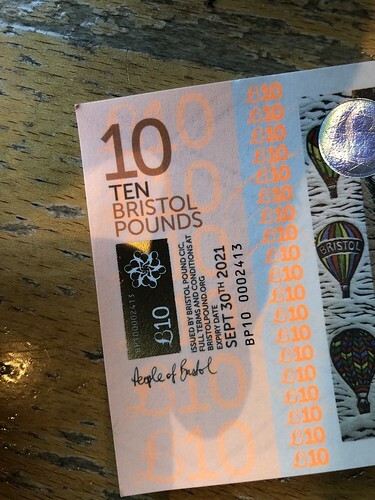 These days the city, while famous for its excellent University and other cultural attractions, is more noted for its contribution to the evolution of next-generation money, being the home of the Bristol Pound (the B£). Here’s a B£ fiver, accepted at par at a number of local merchants. 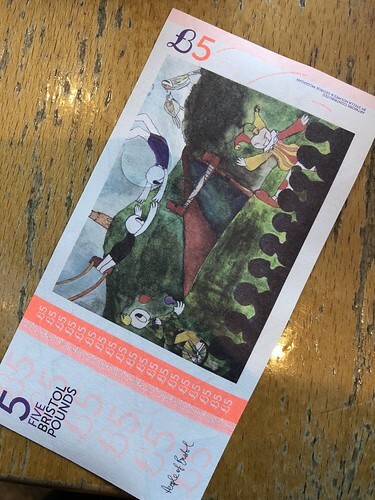 The notes are lovely: this one features art from local children. Now, while the notes are lovely, they have one distinct feature that sets them apart from the Bank of England’s rival product: they carry an expiry date. I think this might be something to do with the law of the land and crude attempts to maintain the Bank’s monopoly over currency rather than an economic calculation about hoarding, but nonetheless it does mean you’d be unwise to stuff them under your mattress and forget about them. If you get one, get out and spend it. The B£ has been around for a few years. 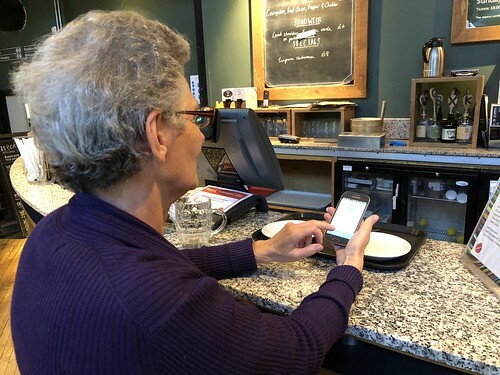 It’s made the jump from paper currency to digital currency already and if you download the B£ app, then you can pay with it at a number of local businesses. Those businesses can also transfer money peer-to-peer within the system to pay their suppliers. I didn’t get a chance to try this out because to get a B£ account you have to have a Bristol postcode so I shall harass some poor student into to trying it out for me and report back. Meanwhile, here’s the app in action at the Watershed Cafe. So why am I writing about the B£ now? Well, the B£ is about to undergo a pretty revolutionary change. To understand why, first recall that strictly speaking while the B£ has some characteristics of a currency (you can pay your council tax with it, for example) it isn’t an independent currency. Rather, it is a form of “currency board”, an arrangement that provides for a fixed exchange rate against some other currency. The B£ in circulation are backed by a 100% reserve held in another currency. In this case, the other currency is Sterling. That Sterling is sitting in an account at the credit union. So far, so Ecuadorian. Talking about Sterling, you’ll recall that almost all of the Sterling in existence (well, 97% of it) was created as bank credit. This happens when you pop down to, say, RBS to borrow ten grand to buy a car. At this point RBS just invent the ten grand out of thin air on a spreadsheet somewhere and add it to your account. You then send his imaginary money through the faster payment service (FPS) to the car dealer and it ends up in their account. They pay some out in wages and it ends up in employees accounts. Some of those employees deposit it in the RBS and so on and on. I know it sound implausible, but I can assure you that it’s true: our money is just made up. B£ don’t work this way. Right now, if you could go to the credit union to borrow B£, then could only lend you the B£ that they had received as a deposit from savers. This autumn, however, B£ are going to become real money, in the sense that they are going to start making the stuff up and lending it to small businesses in the community. The loans will be made in B£ and will be repayable in B£. I’m very interested in the world of complementary currencies and am always curious to see new experiments in the field. In Meyer and Hudon’s paper on “Money and the Commons: An Investigation of Complementary Currencies and their Ethical Implications” at the Solvay Brussels School of Economics and Management (May 2018), they distinguish between “social commons” and “commercial commons” as frameworks for new kinds of money and these categories broadly correspond to the notions of private currency and community currency that I explore in “Before Babylon, Beyond Bitcoin”. The B£ is born in the social commons and is intended to stimulate economic activity with its community. I used to be sceptical about this kind framework and much more interested in the commercial framework because a collection of interlinked community currencies seemed to me less economically efficient in aggregate. I still think this is true, but it may not be the point. I’m wondering if we may need to explore ways to increase economic activity within communities at the expense of inter-community transaction costs as a response to inequality and the unrest that it may cause. 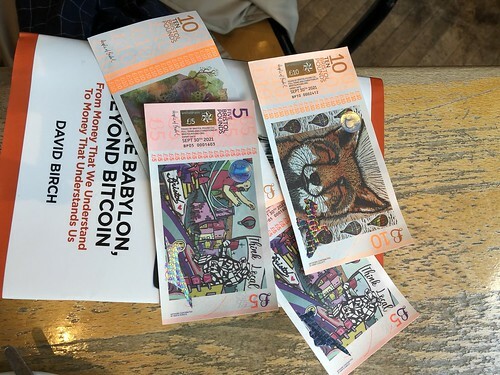 This has implications, because (as I wrote for Quartz recently) if communities rather than individuals become central to money creation then these currencies will be imbued with the values of the communities that create them. This will be a really interesting experiment to see if a social currency can genuinely stimulate a local economy and, as I am very interested in the specific example of city-based social currencies because of my feeling that communities have some role to play in the future of digital money, I will be following the B£ credit experiment with interest and will report on its progress in due course. Incidentally, I do feel bound to mention one obvious improvement that might be made to the app. 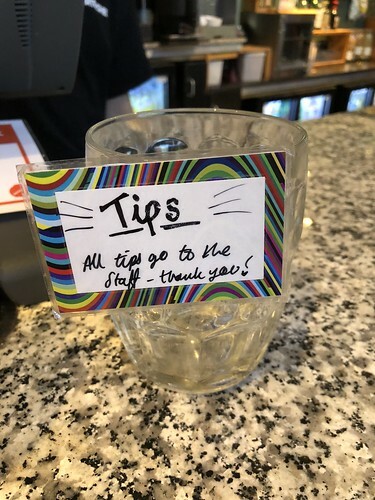 I think a button to add a tip might be usefully provided. By the way, I happen to have three of the lovely Bristol tenners on my desk even as I write and I will cheerfully hand them to the first three people who ask for them in the comments below so that they can visit that lovely city and try out some new money for themselves.